Allie is still here - we have a little more shopping to do today and then will hopefully get to see some of the eclipse before she leaves. Our area is in the 68th percentile of coverage for the eclipse, but cloud cover might impact the visibility. Ah well, there will be another one in seven years, and we'll be much closer to totality then. 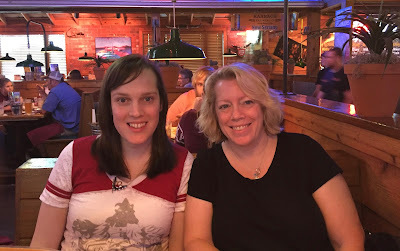 Birthday meal #1: Texas Roadhouse. Yummy as always! One shot - earrings in view! Then Paco decided to jump up and get in the picture. Never change, Paco - never change. We built a Lego birthday cake! Grilled sausages, pasta salad with veggies. Allie and Kevin - friends for over half their lives! We also made our version of a sheetcake for her birthday cake - if you haven't watched Tina Fey talking about current events and how she is dealing with them, you should (here's the link). Even on a slower news day, there was still a lot to sheetcake about. We had a great time and I'm glad we got to celebrate her birthday in person - that doesn't always happen now that she's a working adult, living several hours away from us. What a fun time you guys are having! I think Paco wants his own earrings. And now I want cake. Love Texas Roadhouse!! And so fun that you still get the kids legos for their birthday. She did request a grilled cheese sandwich, but I only had grated Parmesan, so that part didn't happen. Pasco definitely should be the center of attention (according to him LOL). What a lovely birthday. So glad you got to spend time together. Love the Lego tradition. It will be a special memory forever. I'm 47 and my mom still buys be crayons and a color book for Christmas. I love your crayons and coloring book tradition! It's nice to get a simple, throwback gift. What a fun celebration! Happy Birthday, Allie! Everyone needs a friend like Kevin to come over and cook. LOL!!! Love it! We appreciate Kevin, that's for sure! I know, Tina Fey is perfection. Yes, we all need sheet cake. HB Ali! You have a rockin mom. ::Oprah voice:: Sheet cake for everyone! 28 years - Can you believe that? How can it be when I remember that tiny baby so clearly?! It's so cool she was able to celebrate with you guys! I can't remember the last time I saw my parents on my actual birthday, so that's definitely a big thing. We were glad she was home for her birthday - sadly I can't remember the last time we got to celebrate our son's birthday with him in person. This adulting thing is hard! Great article and looks like a fun celebration. Did you know that Peridot is not the original August birthstone? My grandmother was born August 8, 1895 and when she was 16 she was given a Sardonyx ring. Sardonyz is a golden colored stone. When my mom was 16 my grandmother gave her the ring and when I turned 16 I was given the ring. So I have a ring that dates back to 1911 when my grandmother turned 16 and I had it engraved with her name and date. I have had jewelers tell me that they rarely see the Sardonyx birthstone used any more. So Allie is lucky to have more than one choice for a birthstone! Happy Birthday to Allie! Kadult -- got to remember that one! That sketch of Tina Fey was hilarious. I was so impressed she was actually eating that cake! I was impressed that she was not only eating the cake, but managed to get through the piece without breaking! Happy Birthday, Allie. We're gonna need a whole lot of sheet cake. You are so right, Kim! Happy happy birthday Allie! Glad you got to spend her birthday with her and not via facetime. And I had a co-worker that made a Texas sheet cake for everyones birthday and it was to die for! What a fun weekend. Now I guess I need to look up this whole "sheet caking thing". I'm so out of the loop! Looks like a wonderful family birthday weekend, bet you missed Sam a bit. And indeed dear Paco: never change. You make me smile every time with your photo bombs and I am actually disappointed if you don't do that.